>First of all, if you were expecting the “Happy Birthday Pen and Palette” post I said would be up today, well, I had the date wrong. August 6 will be the one year birthday of my blog, so watch for that post on Wednesday! MY NEW EMAIL ADDRESS is sjcushman at gmail dot com. So… over the weekend I made the change. And then I sent out emails from my old Yahoo account to over 500 contacts from my Yahoo address book, asking everyone to PLEASE REPLY TO MY NEW GMAIL ADDRESS so I could simply “click” and put you into my new gmail address book. First let me say THANK YOU to the dozen or so folks who actually followed the directions. Now, for the hundred or more (so far) who replied TO MY OLD YAHOO ADDRESS INSTEAD…. I still love you. (Replying to my old email address didn’t help me add you to my gmail address book, so I am adding you manually.) sigh. Oh, and some folks have asked why I changed to gmail—it’s simply because my Yahoo account was being slammed with spam. Hope this will be better. Next news is that I’ve changed the setting on my feed burner so that only a paragraph or two of my blog posts will arrive in your email boxes, if you’ve signed up to receive posts by email. That way your email boxes won’t get filled up with photos, etc., AND you’ll have to click on the link to the blog when it arrives in your in box to read it here, rather than in your email box. The benefit for me is that when you click on the link to my blog, you are counted on my hit counter, which gives a more accurate counting of folks reading the blog. If you haven’t already signed up for emails each time I post, just put your email address in the feed burner box and you’re done. My daughter Beth and I drove down to Jackson to visit my mom this weekend. Beth hadn’t seen her in a while ‘cause she’s been busy with grad school (architecture at UT Knoxville) so I tried to prepare her for the decline in my mother’s mental condition. If you’ve been reading my blog, you know my mom has Alzheimer’s and lives in an assisted living home in Ridgeland, Mississippi. Her memory loss seems to be hastening a good bit in the past few months, but thankfully her temperament has improved. Most of the time she’s pretty happy, and she tells me over and over how much she likes her assisted living home now. She’s been there two and a half years. I think it took her about a year and a half to really make the shift from grieving the loss of her house and independence to contentment in her new situation. Which is pretty admirable, actually. After four or five more rounds of this conversation, we were finished with lunch and started working on the bulletin board. Beth has finished with the hardware and is ready to arrange the pictures, so I gather up a few stacks and start selecting a few for her to group together. Granny Effie gets up to watch Beth arranging the pictures and looks out the window, where a big yellow machine is parked next to the building, with a crane reaching up to the roof. “They’re working on our building,” she says. I look and see roofing materials. About then Beth has finished arranging the photographs and we hang the bulletin board on the wall. “Sure, Mom.” Elizabeth is Mom’s best friend, who lives across the hall and has two cats and also feeds wild cats that live behind their assisted living home. She’s also the friend I wrote about in “The Good Daughter II” …. Elizabeth comes over and loves the bulletin board. Then she sits down to visit with us, and begins telling us about her cats. About then the aid giving Elizabeth her pill says, “Now, I bet you talk about me like that when I’m not here.” This aid has lots of braids, dyed red, and pulled up on top of her head so that they stick out in all directions. “I’ll bet you say, ‘there goes that big girl whose hair looks like it’s on fire’ or something like that.” And the aid starts laughing. Mom and Beth and I are cracking up by now. The aid leaves and I look at my watch and realize we won’t have time to take Mom out to buy birdseed unless we leave soon, and just as I’m about to suggest we leave, Elizabeth starts back up. I’m guessing this conversation is sparked by Beth’s presence, but I’m not sure, and Elizabeth never addresses Beth directly about being Asian or adopted. She just keeps talking. Beth and I share understanding looks throughout the visit, and I’m so thankful she’s there. She’s patient and sweet with Granny Effie and somehow it just helps me for her to be part of the circle. 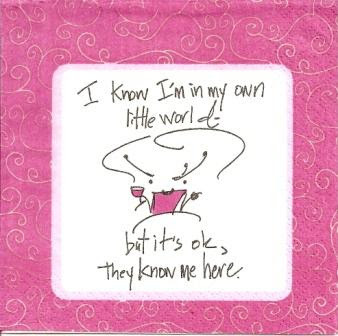 This little cocktail napkin reminds me of our visit with Mom. About then I say it’s time for us to be on the road and so Mom and Elizabeth start walking with me and Beth out of Mom’s apartment and towards the front of the building. On the way we see one of Mom’s dining room table mates, Jamie, playing Scrabble with another resident. Jamie hugs me and I introduce her to Beth and she hugs Beth and tells her, “We’re taking good care of your grandmother.” Later I remind Beth that Jamie is the one that Elizabeth thinks has Alzheimers, but Jamie is the one who plays Scrabble. On the drive back to Memphis, I tell her I’m so glad she came, and thank her for helping me with the bulletin board. Well, actually, she did most of it herself and I just watched. She certainly made my trip to Jackson so much lighter this month. She’s a Good Granddaughter.